Congratulation to this winner! Thank you for sharing your joy of winning by sending in the Winning ticket. This winning number is from the SMS number that we send out. 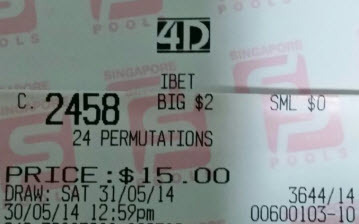 If you are a Gold member, you can receive our 4D forecasted number to your handphone every draw. Join now, just do a bank transfer to our POSB 319-01480-2 and let us know of your transfer by sms to 92300837.